Following the President’s Live Tweet Townhall… JOHN CARPENTER! Live twitter conversation are becoming all the rage these days, so much so that President Obama is engaging in one at this exact moment. But if the leader of the free world isn’t a prestigious enough celebrity for you to text poorly spelled question at, how about a former genre master? The legendary filmmaker, responsible for many of CHUD’s favorite films, has long been out of the game and less than vital. The Ward is his return to genre film, and with it John hopes to return to relevancy in general. Diving head-first into the most recent of cutting edge tech fads is definitely one way of trying. 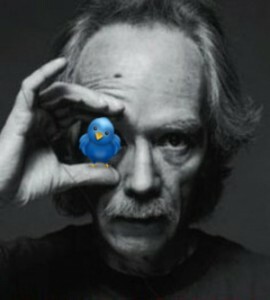 On Friday, July 8, 2011, John Carpenter will be LIVE on Twitter (@ARC_Entertain)!!! He will be answering questions via tweets and video messages from 2:00-3:30pm PST. So follow us on @ARC_Entertain and talk to the “master of horror” himself, John Carpenter!! So if you care to blast a quick question at the director, that’s the time and the medium. Have at it! I’ll be keeping an eye on the conversation, and I know I’d love to see a chewer get in a good one. Kristen (Amber Heard), a beautiful but troubled young woman, finds herself bruised, cut, drugged, and held against her will in a remote ward of a psychiatric hospital. She is completely disoriented, with no idea why she was brought to this place and no memory of her life before being admitted. All she knows is that she isn’t safe.